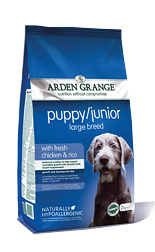 Arden Grange large breed puppy junior dog food has been specially formulated to meet the specific nutritional requirements of a puppy or junior large breed dog. With fresh chicken and rice to provide a complete balanced diet. All Arden Grange dog and puppy food products are hypoallergenic and free from wheat, gluten, dairy products, beef and soya. Arden Grange Large Breed Puppy food contains no artificial colourings flavourings or preservatives. Feeding a high quality dog food such as this reduces the risk of dietary intolerances and allergies that can cause digestive disorders and skin complaints. Highly recommended by the Big Dog World team to keep your large breed puppy in great condition. 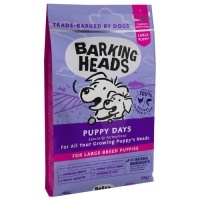 Arden Grange Large Breed Puppy Ingredients:Chicken; (chicken meat meal 30%; fresh chicken 5%); rice 19%; maize; refined chicken oil; beet pulp; chicken digest; krill; minerals; yeast; whole dried egg; whole linseed; prebiotic FOS; prebiotic MOS; glucosamine (370mg/kg); MSM (370mg/kg); chondroitin (260mg/kg); yucca extract; cranberries; nucleotides.